Mathrubhasha Diwas/Mathribhasha Diwas(Mother Language/Tongue Day) Celebrations on February 21, Activities, Essay writing,Painting competitions to be conducted on Mathribhasha Diwas(Mother Language/Tongue Day) on February 21, 2017: Mathribhasha Diwas(Mother Tongue Day) to be celebrated on 21-02-2017, February 21 To Be Celebrated as Matribhasha Divas in all Schools, International Mother Language Day Celebrations on February, 21. Rc.681, Dt.27-01-2017 - Mathribhasha Diwas (Mother Tongue Day) to be celebrated on 21-02-2017. UNESCO has declared 21st February every year as International Mother Language Day to promote the dissemination of mother tongues and fuller awareness of linguistic and cultural traditions through out the world and to inspire solidarity based on understanding ,tolerance and dialogue . Sub : School Education - Celebration of Matribhasa Diwas (Mother Tongue Day) on 21.02.2017 - certain instructions-issued-Reg. The attention of all the DEO & Ex Officio DPOs, SSA, in the State are invited to the reference read above and they are informed that, Govt. have informed that UNESCO has declared 21' February every year as International Mother Language Day to promote the dissemination of mother tongues. It is decided to celebrate Matribhasha Diwas on 21.02.2017 to promote the use of mother longuage. Therefore, it is requested to issue necessary instructions to all the educational institutions of State/UT to organize activities to achieve the above mentioned objectives. During the day, the following indicative activities could be taken up by educational institutions, preferably in at least two languages, possibly "Elocution, Debating, Singing, Essay writing competitions, Painting competitions, Music and dramatic performances, Exhibitions, Online resources and activities as well as events exploring the cognitive, economic, social and cultural activities of multilingual society, Exhibitions depicting linguistic and diverse wealth of India". In view of the above, all the DEO & Ex-Officio DPOs in the State are instructed to take necessary action as per above Govt. Orders and report compliance. Sub : School Education - Celebration of Matrubhasha Diwas(Mother Tongue Day) on 21.02.2017 - Instructions Issued - Reg. -Elocution,Debating,Singing,Essaywritingcompetitions,Painting competitions, Music and dramatic performances Exhibitions, Online resources and activities as well as events exploring the cognitive,social,and cultural activities of multilingual society, Exhibitions depicting linguistic and diverse wealth of India. Sub: School Education - Celebration of Matrubhasha Diwas(Mother Tongue Day) on 21.02.2017 - Instructions Issued - Reg. ~Highlight the linguistic diversity of our country. ~ Encourage usage. not only of the respective mother tongue. but other Indian languages as well. ~ To understand and draw attention to the diversity of cultures. in India and the consequent forums of literature, craft, performing arts. scripts and other forms of creative expression. ~ To encourage the learning of languages, other than one's own mother tongue. Online resources and activities as well as events exploring the cognitive, economic. social and cultural activities of multilingual society, Exhibitions depicting linguistic and diverse wealth of India. 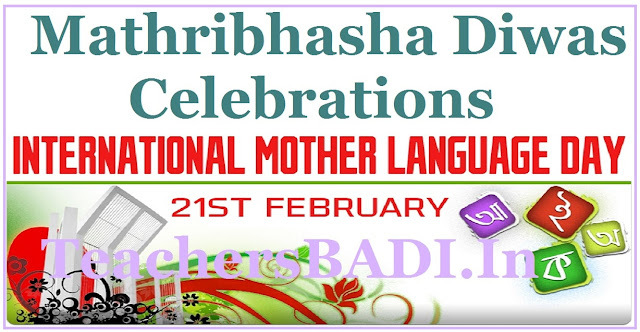 Celebrate Matribhasha Diwas: UNESCO has been observing February 21st every year as International Mother Language Day to promote mother tongues and increase awareness of the linguistic and cultural traditions throughout the world. All the schools, colleges, universities and Language related institutions under both Central and State Governments are celebrating the occasion by holding seminars, workshops, special lectures and various competitions for students on the importance of mother tongue. Some of the unique features of this celebration would be GK competitions on Indian Language Heritage and exhibition on Indian mother tongues. Schools and colleges are encouraged to take up year-long activities to facilitate using one's own mother tongue better and learning other's mother tongue faster and also to create a congenial atmosphere for appreciating and encouraging all Indian languages. Language festivals will also be held in different places for the first time. It is important to preserve and celebrate the thousands of minority languages, but, recalling the vision of the founder of Esperanto, also to find common ways to interact with each other and to foster friendship, peace, understanding, co-operation and interdependence of nations and peoples. Esperanto has a dual role in promoting diversity and creating unity.